Marrying affordability with efficacy, Pixi’s skin care solutions have quickly acquired legions of devotees – from top beauty bloggers and editors, to die-hard customers who are totally addicted to their simple-yet-sophisticated range. 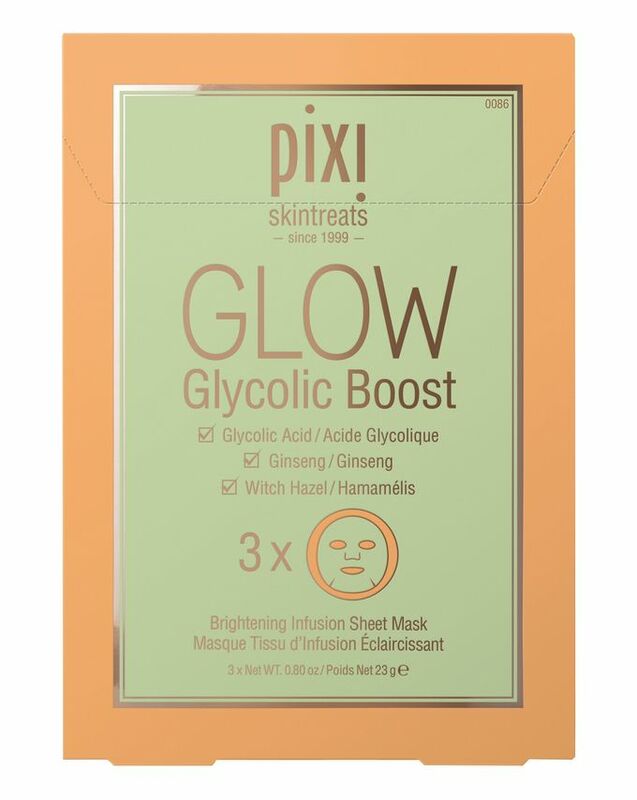 Joining Pixi’s cult range, the new GLOW Glycolic Boost Brightening Infusion Sheet Mask is saturated in a glycolic acid concentrate that will brighten skin while herbal extracts help to improve and maintain skin health, promoting more luminous skin. An extension of Pixi’s iconic Glow range, their brand new GLOW Glycolic Boost Brightening Infusion Sheet Mask promises to instantly brighten and hydrate skin. Delivering a gorgeous cooling effect on application, this mask is seeped in good-for-skin ingredients that will brighten and hydrate in just 15 minutes. Glycolic acid gently exfoliates and brightens skin while antioxidant-rich ginseng provides deep hydration, retexturizes, evens skin tone, visibly diminishes fine lines and wrinkles as well as improving skins firmness. Finally, witch hazel and cucumber sooth skin, relieving inflammation and irritation for a calm and even skin tone. Perfect for any Pixi devotee with a major weakness for the Glow Tonic, add this glow-giving treatment into your routine for a luxe and luminous treat. The best time to use a sheet mask is after cleansing on bare skin. 1. After cleansing, place sheet mask onto face and pat into contours to fit snugly. 2. Leave on for 10-15 minutes. 3. Remove mask & pat in excess serum to face, neck & décolletage. Store in fridge for a refreshing and de-puffing effect. Aqua/Water/Eau, Dipropylene Glycol, Glycerin, Glycolic Acid, Red Ginseng Extract, Aloe Arborescens Leaf Extract, Panax Ginseng Callus Culture Extract, Camellia Sinensis Leaf Extract, Cucumis Sativus (Cucumber) Extract, Castanea Sativa (Chestnut) Seed Extract, Dioscorea Japonica Root Extract, Ocimum Basilicum (Basil) Seed Extract, Hamamelis Virginiana (Witch Hazel) Extract, Morus Alba Bark Extract, Asiaticoside, Coix Lacryma-Jobi Ma-yuen Seed Extract, Illicium Verum (Anise) Fruit Extract, Trehalose, 1,2-Hexanediol, Propanediol, Caprylyl Glycol, Ethylhexylglycerin, Potassium Hydroxide, Xanthan Gum, Butylene Glycol, Disodium EDTA.